>You would think doing a search on an online dating profile in Sacramento would be a simple thing. But, it seems that the people behind Match.com are more tricky in their math than I first suspected. This isn’t necessarily a bad thing. I just have to adjust my thinking when it comes to profile search results. Now, when I “remove” a profile for one reason or another…that number drops down to 1999. So, the plus is a little mystifying. However, if I go back and “edit” my search criteria by doing nothing but hitting the search button again from the primary search screen, I get 2000+ results again. Apparently, Match only shows you the top 2,000 profiles. Granted most of these profiles are pretty much in active. I don’t look at any guy who hasn’t been active in the last 24 hours. Why bother? Also, I’ve heard that if you make a change to your profile, you go to the top of the search results. I’ve always wondered how the “Match Picks” sort was defined. I have noticed an uptick in activity since started a weekly nip/tuck to my profile. 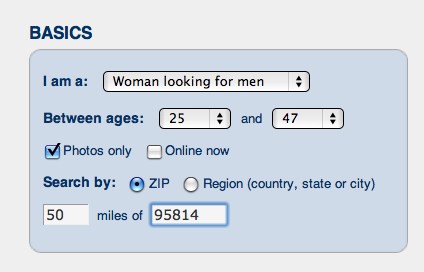 Maybe I should increase my minor changes to see if I can actually get a date. This drought is almost 7 months now. It’s got to be stopped, so I expanded my search radius from 30 to 50 miles. Which is why I replied to an email I got from Quasi-Ugly Guy. There is the possibility that he might be more attractive in person. Some men just can’t seem to figure out what a good picture of themselves is…His profile is a little on the boring side though. So far, he hasn’t replied to my email, which is not surprising to anyone. If you are keeping score at home, the Football Player still texts me from time to time, but I haven’t heard from him in 24 hours and I’m not going to be the one to contact first, which probably means he’s a goner. It was nice to have attention from a guy even if it was just digital. I would have much preferred to meet him in person, but at this point, I’ll take what I can get. >Love, what is it good for? >Hmm. I seemed to have forgotten to mention the not enough part. If I slim down my choices I get like 300 eligible bachelors…which is probably more like 30 and 95% of them are UNDATEABLE.